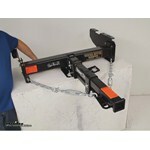 TorkLift's custom, frame-mounted tie-downs let you secure your truck bed camper to your pickup for the long haul. 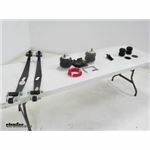 By attaching to your truck's base instead of its bed, these tie-downs better distribute weight to keep your setup from being too top-heavy. TorkLift's SuperHitch dual-receiver trailer hitches let you tow a trailer and carry a hitch-mounted bike rack or cargo carrier at the same time. 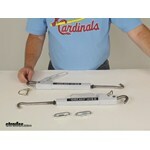 Pre-drilled mounting points are in place for attaching TorkLift's super-sturdy camper tie-towns. 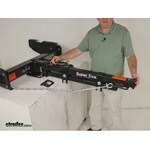 GlowSteps ensure proper footing as you climb into or out of your RV or camper. 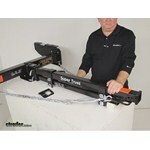 Lightweight, rustproof scissor steps easily fold up for storage. Glow tape provides nighttime visibility. TorkLift StableLoad pads install in your vehicle's factory overload springs to give you improved handling with minimal sway and body roll. 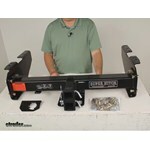 Heavy-duty SuperTruss hitch extensions work with TorkLift SuperHitch dual-receiver trailer hitches to extend the top receiver of the hitch so that it clears your camper, allowing you to tow your trailer while your camper's installed. 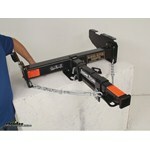 Extensions maintain a high capacity and can be used with weight-distribution systems. 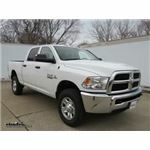 For your 2008 Dodge Ram 3500 long bed with a Torklift Hitch part # TLD1102-30 the correct set of Torklift Camper Tie Downs are the # TLD2101 for the front and the part # TLR3503 for the rear. 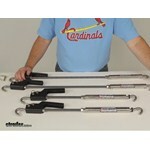 I attached an install video for these for you to check out as well. The TorkLift PowerArmor Locking Battery Box # TLA7710R has dimensions of 58-1/2" long x 7-5/8" wide x 12-3/4" tall so the four six volt batteries you have should be able to fit in the box with room for another one. This same battery box with a solar panel # TLA7710RS is available to provide power to the batteries. 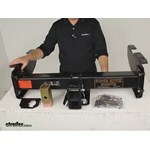 The TorkLift PowerArmor Locking Battery Box is made in the United States of America and comes with a lifetime warranty. 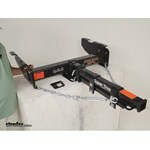 Our range of trailer battery boxes is shown on the linked page. These include standard plastic and metal boxes as well as ones with built-in solar chargers to help maintain your battery power level, such as TorkLift # TLA7708RS which measures 26-3/4 long x 8-3/16 wide x 13 tall. 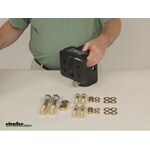 This unit includes straps to secure your 6V batteries so no mat is needed. All boxes' measurements are noted on each item's page. If the mounting surface on your RV is 32 inches off the ground the 4 step version of the TorkLift GlowStep Revolution Scissor Steps # TLA8004 would be the best choice as it has 7-1/2 inches between each step which would put you right at the correct height you would need. I spoke with my contact at Torklift and he informed me that from the mounting surface of where the Torklift Steps part # TLA8004 attaches down to the first step measures 3 inches in the highest setting. He also said that there is a 3 way adjustment you can make for the position of the step that will change that distance. Highest is 3 inches, middle is 5 inches, and lowest is 7 inches. 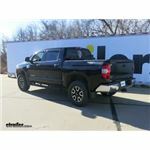 The hitch extenders that are rated for 10,000 pounds are all for tow bar applications only so we have to take a different approach. 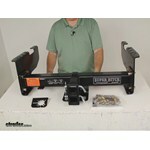 If you have the factory trailer hitch that is welded onto your 2014 Ram 3500 then the best option would be to add TorkLift SuperHitch # TLD1108 and then use SuperTruss Extender # TLE1521. 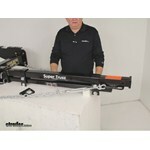 When using the SuperTruss extender you would have to then use weight distribution to get the capacity to 14,000 pounds. 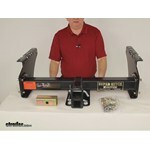 Recommended Weight Distribution for Trailer Tongue Weight of 2194 lbs. The part # TLA7708R is a heavy duty battery box that can carry up to two batteries depending on dimensions of them. This box has dimensions of 26-3/4" long x 8-3/16" wide x 13" tall. 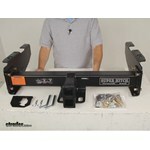 The universal design of this box would allow you to install it easily on your trailer tongue. 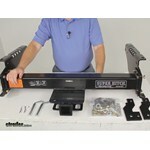 The TorkLift GlowStep Revolution Scissor Step # TLA8004 does include the hardware to install the mounting base on the frame of your Grand Design 5th wheel. The hardware is shown in the linked photo. The included video highlights the step's features and shows the installation. 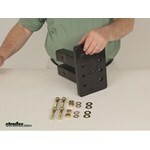 The specific RV shown has vertical step mounting studs so it also required Vertical Stud Adapter Bracket Item # TLA8022. Since the height from the ground to the doorway on your Jayco Model 29RKS is 34 inches the Torklift GlowStep Revolution part # TLA8004 that you referenced is the correct step to go with. 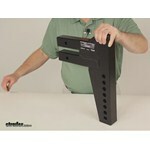 This step has a height range of between 32-1/2 and 44 inches. I attached an install video link for these steps on a very similar 2015 Jayco Pinnacle for you to check out as well. Since your doorway/threshold height is 36 inches the correct Torklift GlowStep is the part # TLA8004 which has a threshold height range of 32-1/2" - 44" and would work perfectly. 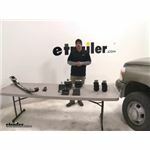 I attached an install video for this kit as well as a picture of what it looks like installed too.